The readers are informed that the text given in the biosynthesis section of originally published article (doi: 10.3389/fpls.2015.01230) at line number 20–30 of page number two is not definitive and has very limited scientific evidence, so it should not be considered. Some steps illustrated in originally published Figure 1, like the conversion of tryptamine to Indo-3-acetaldehyde and indole acetic acid (IAA), and direct conversion of serotonin to melatonin by SNAT are not definitive, as they have very limited scientific evidence. So these steps should not be considered the part of originally published Figure 1. Figure 1. Biosynthesis of melatonin. The red arrows identify the preferred pathway in plants while the black arrows identify the major pathway in animals. 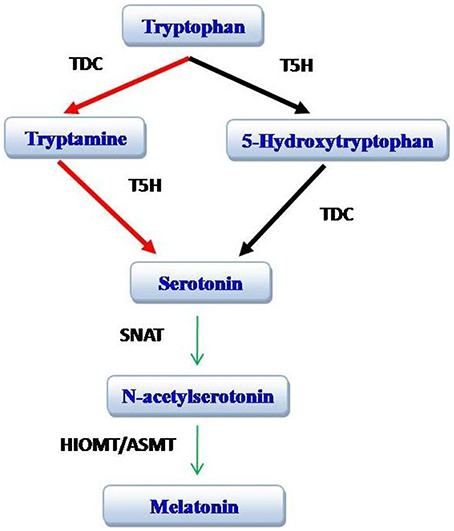 TDC, tryptophan decarboxylase; T5H, tryptophan 5-hydroxylase; SNAT, serotonin N-acetyltransferase; HIOMT, hydroxyindole-O-methyltransferase [also known as acetyl serotonin methyl transferase (ASMT)]. Modified from Arnao and Hernandez-Ruiz (2014). Copyright © 2016 Nawaz, Huang, Bie, Ahmed, Reiter, Niu and Hameed. This is an open-access article distributed under the terms of the Creative Commons Attribution License (CC BY). The use, distribution or reproduction in other forums is permitted, provided the original author(s) or licensor are credited and that the original publication in this journal is cited, in accordance with accepted academic practice. No use, distribution or reproduction is permitted which does not comply with these terms.